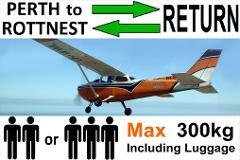 ► Perth to Rottnest AND RETURN, up to 3 passengers - FLEXIBLE Times - FLEXIBLE Days. 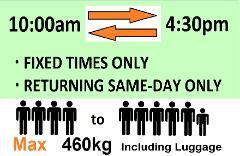 Many departure times every day for maximum flexibility. A few hours - or a few days! Three passenger seats. Two children under 30kg each can share a seat. $490 all up for the round trip: That is $245 EACH FOR 2 or $164 EACH FOR 3. ◄► Discount Perth to Rottnest AND RETURN - up to 3 passengers -- Day-trip Only. One per day only. This is a discount day-trip, limited to the departure times mentioned. Three passenger seats. Two children under 30kg each can share a seat. $430 all up for the round trip: That is $215 EACH FOR 2 or $144 EACH FOR 3. 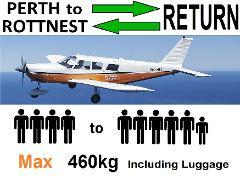 [►] Perth to Rottnest AND RETURN, 4 to 6 passengers - FLEXIBLE Times - FLEXIBLE Days. Many departure times every day, for your convenience. Stay a few hours - or a few days! Six passenger seats. Two children under 30kg each can share a seat. $590 all up for the round trip - that is $148 EACH FOR 4 or $118 EACH FOR 5. [◄►] Discount Perth to Rottnest AND RETURN - 4 to 6 passengers - Day-trip Only. A discount day-trip, limited to the departure times mentioned and simple to book. Six passenger seats. Two children under 30kg each can share a seat. $530 all up for the round trip - that is $133 EACH FOR 4 or $106 EACH FOR FIVE.